very happy with this purchase. matches my kitchen perfectly. like the fact that it is rubber and not fabric making it much easier to clean. 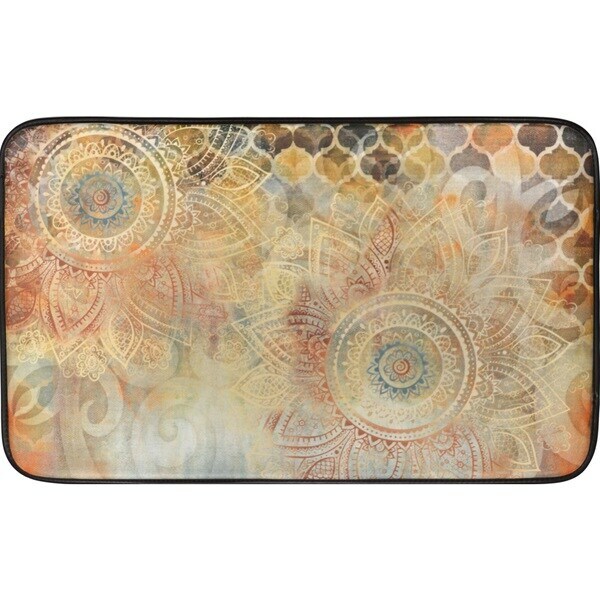 Cook longer while beautifying your kitchen with this anti-fatigue mat featuring an earth-tone abstract pattern. The thick water-resistant PVC surface cushions and cradles your feet, making this low-maintenance mat ideal for both home and professional kitchens. These are very pretty....i wanted something just to add a little pizzazz and color to my kitchen and I like them for that however, they have quarter sized plastic type pieces in them spread throughout. Not exactly sure what they are but if you're barefoot or have just socks on you can feel them which kind of defeats the purpose of making it more comfortable to stand there and cook or wash dishes etc. I do really like the look of them though and I just move to where I can't feel those plastics things so it hasn't been that big of a deal for me. 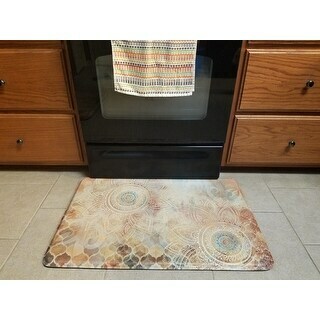 Pleasantly surprised at the great quality of this kitchen mat. The colors are even more vivid that the picture. I love how pretty the pattern is, and easy care. You just have to wipe these off with a wash cloth. I have one in front of my sink and another in front of my range, and they are so comfortable to stand on. I don't feel like I am sinking in like other foam mats that I have had. and they don't slide around. The ONLY negative is that after a year the seam is open on the side on each of them in the same area, that is why I chose 4 stars instead of 5. Hopefully I can fix it and no big whoop. Overall, it is a very pretty and practical purchase. 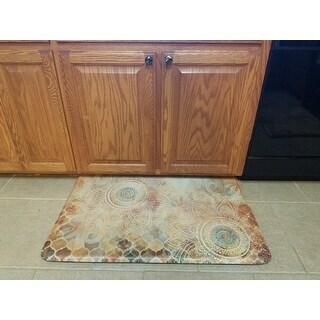 Much more comfortable than your standard flat kitchen mat. Pretty, but color was not right. Had to return them. "How do u wash this rug?" This is a heavy rubber Mat. I take it outside squirt a little soap on it and scrub it with a brush with a with a broom let it dry and bring it back in the house it is very thick so won't go in the washing machine it I take it outside squirt a little soap on it and scrub it with a brush or with a broom, let it dry and bring it back in the house. it is very thick so won't go in the washing machine at all.